Exam Held On : 20th January 2019. 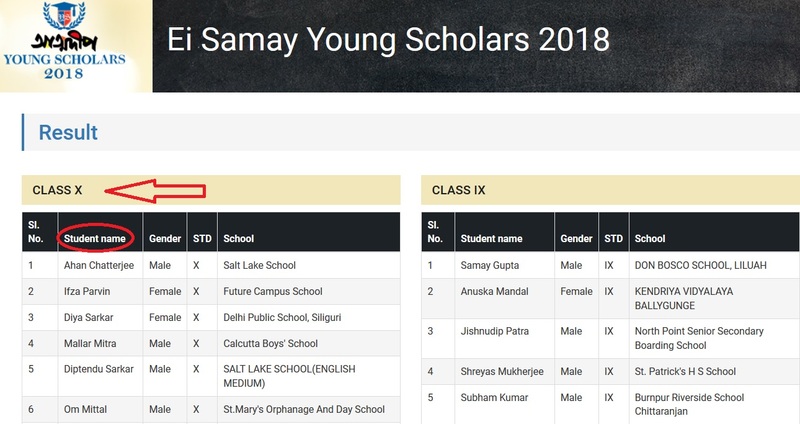 Results of Ei Samay Atmadeep Young Scholarship Exam 2018-19. Just follow the below steps to check your results of Ei Samay Atmadeep Young Scholarship Exam 2018-19. Step 2 : Next click on the “Results” link in the menu bar. Step 3 : Find your name under which class you are studying. 14 Sudisha Pal Female VI Loreto Day School, Bowbazar, Kolkata – 700012. 7 Aranyak Sarma Male VII GARDEN HIGH SCHOOL . IISER KOLKATA CAMPUS. MOHANPUR . NADIA. 21 Avishek Saha Male VII St. Xaviers Collegiate School, Park Street, Kolkata. My son name is in the Class V merit list, but no further information from your end, Please reply.